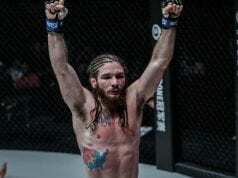 After an unclear resolution to their first match, Edward “The Ferocious” Kelly is anticipating a hungry Christian “The Warrior” Lee in their upcoming rematch on January 19 at Istora Senayan in Jakarta, Indonesia. They are ardent representatives of prominent martial arts gyms Team Lakay and Evolve MMA, and will meet once more in a main card match at ONE: Eternal Glory. Both featherweights are known to be excellent finishers and good show closers, which did not happen during their first encounter last September. Lee executed an illegal suplex maneuver that caused the Baguio city native to land on his head, which warranted a disqualification ruling. Despite the win, “The Ferocious” admittedly had difficulty Lee’s ground game. He knows that this rematch is important for both he and Lee, given that he has a point to prove and both fighters want to settle their unfinished business. As such, Kelly mentions he has a few surprises for his younger counterpart. “In our first match-up, I learned that he’s overly aggressive, so that’s what I’m preparing for. He’s explosive, and he’s good on the ground – a submission artist,” explained the 34-year-old Team Lakay representative. Kelly hails from the stable of Team Lakay where four of its members currently hold ONE World Championship belts, a prestige that he feels honored to uphold despite not being a world champion. And although Lee is a former ONE World Title challenger himself, Kelly feels that the youngster will have a tougher time with him in the rematch due to his improved skills. “We know that Lee is aggressive and he likes to finish people, but against me, he won’t be able to get that easily. Of course, I’m going for the win as well. The pressure is on us, but we need to stay focused,” he admitted. With a record of 11-5, the 34-year old hopes that a win against “The Warrior” would earn him the right to challenge Martin “The Situ-Asian” Nguyen for the ONE Featherweight World Title, which would give him an opportunity to be the fifth Team Lakay member to hold a ONE World Title. “I think I need at least another win before I get that world title shot,” Kelly concluded.